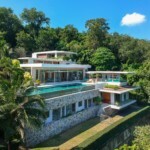 Villa is perched on the end of its own private peninsula, one of the easternmost points on Phuket with expansive views across Phang Nga Bay, north to Phuket Town, South to Tapao islands and east to Phi Phi. The view is 180 degrees of blue dotted with the greenery of island scenery with yellow sandy beaches. The true secret of Hollywood apart from its supercool chic is your ability to immediately set off to the myriad islands and beaches dotted around this part of the coast line and Bay. Want to snorkel in crystal clear waters, lie on deserted beaches within 15 minutes from your 5 star Phuket Villa., then this is all so easy from Villa.